Here I am, thinking about buying Skyrim again on Switch. Yes, Skyrim. A game I've played for 197 hours on Steam in addition to God knows how many on console. I've already made the case for why the Switch is so good for playing old games. Look no further than the impressive number of hours I've put into Minecraft and Cave Story in 2017. While there are lots of Nintendo's own classic games I'd play (or play again) on Switch, it's a safe bet that they will march to their own drummer when it comes to bringing those up. Games released by third-party publishers, however... well, it's just a matter of who wants to make more money on their old games first. So. What other games might I buy again on Nintendo's handheld? Let's see. Are you kidding me? There was a time when I played Half-Life 2 about once a year. Those times could return, if I could do it on the bus. Maybe at the end of Episode 2, they can have the Switch web browser automatically load up Epistle 3. How is this not a thing? This should be a thing. Can you imagine? Of course you can. BioWare: Please do this. Throw in Knights of the Old Republic and Jade Empire while you're at it. I mean really, we could do all of the Assassin's Creed games, but this is the one I'd most like to play on the go. Ubisoft clearly has a taste for the Switch after the success of Mario + Rabbids, so maybe this will actually come to pass. I like Resident Evil Revelations on Switch and everything, but I want to play RE4 so much more. I missed out on the Wii port, and the Switch Joy-Con do a passable Wiimote imitation. I feel like this one is likely. This one, also, seems like a sure thing. I've still never finished MGS3, and think the Switch might finally be the platform for me to finish the whole game. I already own it on like five different systems, what's a sixth? Take a break from Pachinko for five minutes and port it over, Konami. I would also play Fallout 3 again on Switch, but what I really want to play is New Vegas. I never finished that game, if there is such a thing as "finishing" a Bethesda game, but I bet I would if it came to Switch. Right after I finish Skyrim again. Yep. Yes. Make this happen, From. Make it happen! Come on! What do I have to do?? Here's an interesting indie game that I bet a lot of people still haven't played, and it'd be good as heck on the Switch. You could pop the Joy-Con off of the console and feel even more like you're playing a co-op game with yourself. Let's just use this entry as a stand-in for all the good last-gen indies like Braid and Bastion and the rest. They can all come to Switch, and I will play them. I guess they will probably port the whole Return to Arkham collection to Switch, but I mostly just want to replay the first game. Though I actually never got very far in that side-scrolling Metroidvania one (Arkham Origins: Blackgate) so hopefully they will port that over, too. Another one that will probably turn up in some sort of Dead Space collection, but really the only one I'd want to replay. Maybe they could add Resident Evil-style motion aiming, the better to CUT OFF THEIR LIMBS. I like Far Cry 2 better than its sequel, but for some reason Far Cry 3's colourful, violence vacation vibe would work better for me on a handheld. I would play the hell out of either one on Switch. Yep, would definitely play these again on Switch. Especially BioShock 2, the weird and underrated one that I only played once and don't remember that well. There are probably a hundred more old games that I would definitely buy again on Switch, but those are a start. Would I finish them? Probably not. Would I look back in a few years, see how little I played most of them, and regret my purchase? Maybe. Do I still hope they come to Switch, just so I can have the possibility of playing them all on the go? I do. I just want Punch-Out! arcade version. I'm an up and coming fighter. Does anyone know when Punch Out is coming out? Mario Bros Arcade and Traverse USA have been released so far. I want more remakes of oldschool games along the lines of Wonderboy: The Dragon's Trap. How about a virtual console while we're at it? All they need to do to ensure the future of Nintendo is to port Smash Bros Melee to the Switch. Would prefer a new game rather than a port, personally. This may seem a tad hostile but the pros can piss off at this stage for all I care. The Melee scene needs to die and Nintendo should continue their stance on hands off approach with it while supporting 4 and what I assume will eventually be 5. Not sure about the Virtual Console. They seem to screw it up every time. Maybe outsource it. i'd give up the ability to play every new game if i was able to run emulators on the switch. I say it every chance I get, but I really do believe that the Switch would be a great home for the Mega Man Legends series. A Paper Mario collection would be awesome, as well as pretty much every JRPG I've ever played. I know everyone craps on it but Mighty No 9 would be great on the Switch. Pretty much every Metroid game would work well. All that said I find my love is in the future. As much as I want the MML Collection I'd prefer MML3 or even just a love letter to MML along the lines of Shovel Knight. Goldeneye lol I can dream. Looking forward to when the Switch is hacked and I can stream Steam to it. Yeeeeeeep. I'd easily clock /another/ 999+hours in FFT if it was on the Switch. Don't have any wild requests just any VC style games. Would love to play Super Mario 1-3, Punch Out, original NES Tetris on the Switch. 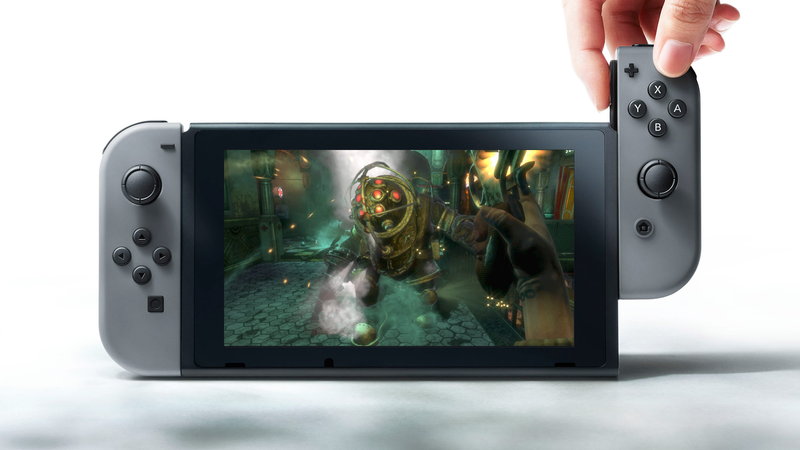 Would pay for that and a switch if they did it. If you want MGS 3 on the Switch, might as well ask for the HD collection. A simple endless game from a few years ago, Gauntlet: Slayer edition.